I met Amanda in our hostel in Medellín. When she said she was traveling solo for a week, I was like yas, girl!! Of course, I had to feature her. 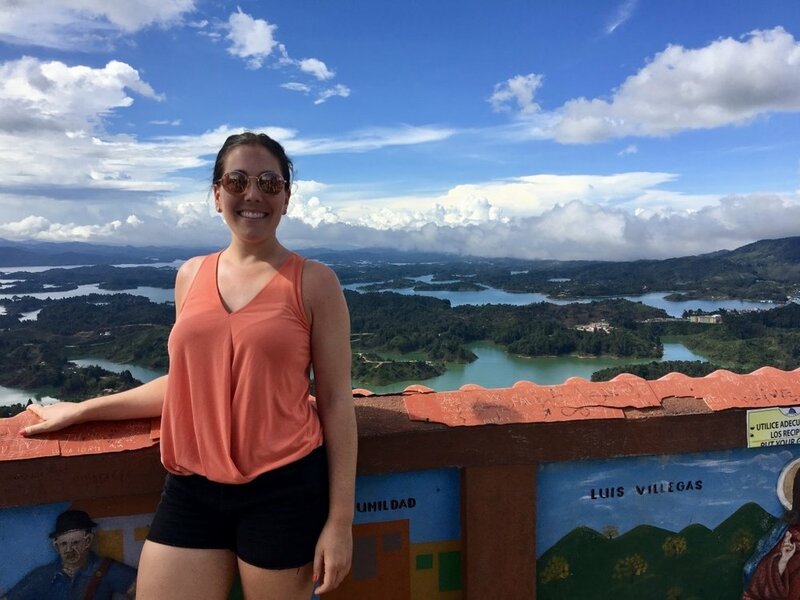 She packed in 3 cities in 1 week without burning out so this is a great itinerary to follow. My hostel in Medellín partnered with a free walking tour, which gave great insight into the history and culture of Medellín. With our tour guide and fellow travelers on one of the stops on our tour to Guatapé. We jumped off the bridge and went swimming in the lake below. The most amazing lunch! Part of the day tour I took to Guatapé. The most beautiful hostel in Salento: La Serrana! I highly recommend staying here and treating yourself to a private room if it’s in your budget. So peaceful with such incredible views. View from my hostel in Salento. Bosques de Cocora in Salento aka the famous tall skinny trees of Cocora Valley in Salento. Hiking with new friends from Germany, England, and Canada + Colombian puppy. Part of my favorite thing about traveling solo was meeting fellow travelers from around the world. Old Town in Cartagena is surrounded by a stone wall. The entrance is this beautiful, colorful clock tower. 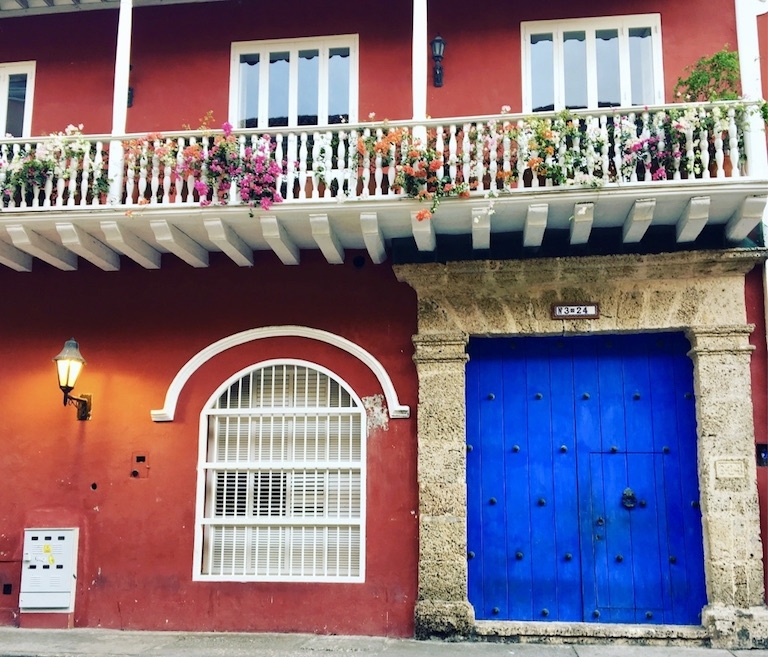 There are so many colorful facades inside the walled Old Town of Cartagena. Sipping on a delicious piña colada at Playa Blanca in Cartagena. Treating myself to a nice dinner on my last night and getting proof that I traveled and dined solo! If you liked this feature, then sign up to get the next one and her itinerary in your inbox. 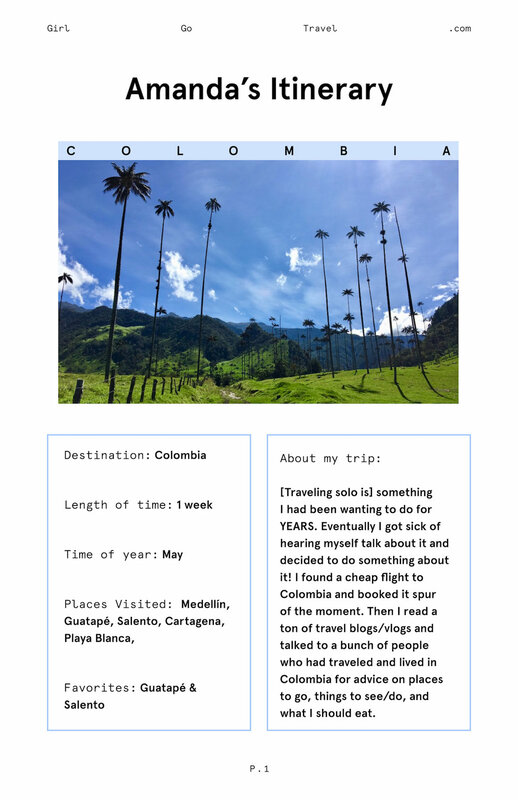 Feel inspired and prepared to travel solo by getting stories like this and travel advice in your inbox twice a month.